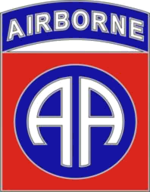 The 82nd Airborne first saw combat on the Western Front during World War I, where it served with distinction in St. Mihiel and the Argonne Forest. Its first action in World War II was in Italy, where it made parachute landings in both Sicily and Salerno. The division was then transferred to England, where it began preparing for D-Day. The night before D-Day, the division jumped into German held territory behind enemy lines. The division was subsequently engaged in bloody combat for 33 days. During those days, it captured and held the majority of its objectives, but suffered heavy casualties. The division then took part in Operation Market-Garden where it secured the Nijmegen bridge and surrounding area, despite heavy German resistance. The division then fought in the Battle of the Bulge and eventually spearheaded an offensive across the Elbe River, during which they captured over 100,000 German troops. After the war, the division served in Berlin doing occupation duty. After WWII, the division deployed to the Dominican Republic during the civil war that was happening there. Then, the division was sent to Vietnam and fought in Hue during the Tet Offensive and fought in the Mekong Delta, Iron Triangle, and Cambodian border. After Vietnam, the division served in the invasion of Grenada, Operation Just Cause in Panama, and Operation Desert Storm. The 82nd was also deployed as a peacekeeping force in Haiti, Bosnia, and Kosovo. The 82nd has most recently fought against Islamic terrorists in Iraq and Afghanistan.